Chairman Garrett, thank you for hosting this important hearing today on the JOBS Act and the need to enhance capital formation. The Small Business & Entrepreneurship Council (SBE Council) is pleased to submit this testimony. Thank you for your invitation. My name is Raymond Keating, and I am the chief economist for SBE Council, as well as serving as an adjunct professor in the Townsend Business School at Dowling College where I teach a variety of courses in the MBA program; and being the author of several books, including the latest nonfiction book being Unleashing Small Business Through IP: Protecting Intellectual Property, Driving Entrepreneurship. SBE Council is a nonpartisan, nonprofit advocacy, research and training organization dedicated to protecting small business and promoting entrepreneurship. With more than 100,000 members and our network of business groups nationwide, SBE Council is engaged at the local, state, federal and international levels where we collaborate with elected officials, policy experts and business leaders on initiatives and policies that enhance competitiveness and improve the environment for business start-up and growth. Since our founding in 1994, SBE Council has helped to strengthen the ecosystem for small business and entrepreneurial success in the U.S. and across the world. Access to capital has remained one of SBE Council’s core issues since our founding. Access to financial capital – whether via equity or debt – is vital for entrepreneurs seeking to start up, operate or expand businesses, and at the same time, gaining access to capital has remained an enduring challenge for many small businesses. The financial crisis and Great Recession made the situation worse as capital became increasingly hard to access from institutional banks and various capital market players. And while there have been improvements due to the economic recovery and healing in the capital markets, many entrepreneurs continue to struggle with accessing the capital they need to compete and grow. 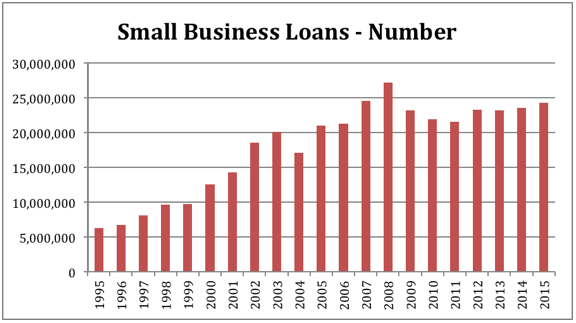 Consider the decline in bank small business loans (less than $1 million) over the past several years. The value of small business loans outstanding hit a high of $711.5 billion in 2008, and subsequently fell for five straight years, with some growth resuming in 2014 and 2015. The 2015 level came in at $599.3 billion, which is roughly where the small business loan level was in 2005. That’s a decade of no growth. 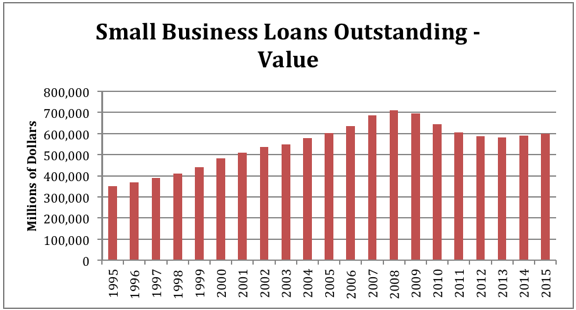 The small business share of commercial and industrial loan value outstanding registered, for example, 33 percent in 1995, 35 percent in 2004, and 30 percent in 2007. As of the fourth quarter of 2015, however, it had fallen to only 20 percent. Looking at nonfarm nonresidential loans, the small business share came in at 52 percent in 1995, and had declined to 39 percent in 2007. At the end of 2015, the small business share further declined to 23 percent. As for the number of small business loans, these rose steadily up to 2008 (hitting 27.1 million in 2008 compared to 6.3 million in 1995), and subsequently declined and struggled to recover, climbing back to 24.3 million in 2015. On the equity side, angel investment is a critical source of funding for start-ups and early-stage businesses. But here, again, the story has been one of under-performance or sluggishness in recent years. According to the Center for Venture Research at the University of New Hampshire, after a big drop in 2002, coinciding with the aftermath of the 2001 recession (as well as the post “tech bubble”), growth resumed from 2003 through 2007, with angel investments increasing from $15.7 billion in 2002 to $26 billion in 2007. However, subsequently, there was a big drop-off in 2008 and 2009, and the subsequent growth has been underwhelming. For all of 2014, angel investment came in at $24.1 billion, down from $24.8 billion in 2013, and still not back to the $26 billion level in 2007. In fact, the 2014 level came in just ahead the 2005 level – again, nearly a decade of no growth. For the first half of 2015 compared to the same period in 2014, angel investment was up by 4.1 percent. To sum up, long after the financial crisis hit in late 2008 and the Great Recession came to an official end in mid-2009, the value and number of traditional small business loans are still down markedly, and angel investment is still down compared to 2008. Based on these numbers, the struggle for entrepreneurs to gain access to the financial resources needed to start up, thrive or just survive continues to be difficult. The bottom line is that small businesses need more options or avenues to expand access to financial capital. The securities market would seem to be an option, but the regulatory and legal costs long had been prohibitive. In the midst of these struggles, SBE Council staff and members were instrumental in advancing the JOBS Act into law. SBE Council President Karen Kerrigan and key SBE Council members joined President Obama at the White House for the JOBS Act signing ceremony in April 2012. The overwhelmingly bipartisan bill focused on helping to stimulate the U.S. economy by promoting capital formation. -Title II (“Access to Capital for Job Creators”) allows for “accredited investor” crowdfunding by letting “private companies conducting a private placement under Regulation D Rule 506 to publicly market the offering. Before that such marketing was banned. The securities can only be sold to accredited (wealthy) investors. Specifically, the JOBS Act amended Reg D Rule 506—a widely used securities exemption for private companies raising money from accredited investors—to include a new sub-rule, Reg D 506(c) that eliminates the ban on general solicitation and advertising. Companies issuing securities under the new 506(c) exemption can now openly talk about and advertise the fact they are raising money… In practical terms, Title II improves the existing private placement process, allowing companies to reach out to more accredited investors, but it does not represent a major new funding avenue.” The rules went into effect on September 23, 2013. – Companies being able to raise up to $1 million every 12 months. -Title IV (“Small Company Capital Formation (aka Regulation A+)) “required the SEC to boost the offering amount allowed under Regulation A from $5 million and fix some of its drawbacks, namely the need to register with both federal and state regulatory authorities. The new Reg A+ rules create two tiers of offerings: Tier 1 allows issuers to raise up to $20 million in a 12-month period; Tier II, up to $50 million. Significantly, the SEC preserved the ability for unaccredited as well as accredited investors to participate in Reg A+ offerings, making it a true public offering. And it added a valuable tool: the ability for companies to ‘test the waters’ with potential investors before committing to an offering. This is a capital-raising tool for high-growth companies with large capital needs. And it is not inexpensive. Issuers need to file a thick offering document (Form 1-A) with the S.E.C. for approval. Tier 1 preserves the need for state by state “Blue Sky” registration and review, which is costly and time consuming. And Tier 2 imposes on companies an ongoing reporting burden, including audited financials, much like the reporting requirements of a public company.” The rules went into effect in June 2015. Even given the significant and positive changes being brought about for entrepreneurs and investors with the JOBS Act, there are areas in need of improvement. A serious concern persists regarding extra government regulation or placing too many limitations on the ability of entrepreneurs to gain access to capital, and/or on investors’ abilities to make investments in entrepreneurial ventures. Indeed, few better understand the costs of government regulations, rules and restrictions than small businesses owners. After all, they are on the frontlines of having to deal with the very real costs of regulation, whether that means dealing with added costs of running a business day to day, or if it means reduced access to financial capital. “While crowdfunding was intended to be a treat for the smallest and least sophisticated companies seeking to raise capital, today’s rules are full of tricks. The rules will spin a complex web of provisions and requirements for compliance. I fear that many traps for the unwary are hidden in the regulations, creating potential nightmares for small business owners that fail to place regulatory compliance at the top of their business plans. Such burdens will spook many small businesses from pursuing crowdfunding as a viable path to raising capital. “A number of concerns have already been raised as to whether our rules are too restrictive or too burdensome. In fact, many of these restrictions are embedded in the statute itself. For instance, even if you are Warren Buffet or Bill Gates, you are limited to investing no more than $100,000 during any 12-month period in all crowdfunding investments. In terms of making headway toward reducing the costs for entrepreneurs to gain access to financial capital, SBE Council supports the four legislative initiatives being considered at this hearing. The Private Placement Improvement Act (H.R. 4852) would amend federal securities laws to ensure that small businesses do not face complicated and unnecessary regulatory burdens when attempting to raise capital through private securities offerings issued under SEC Regulation D.
The Regulation D capital market is a critical one for the U.S. economy. In 2012, Regulation D offerings ($903 billion) accounted for over half of all private offerings. It is the primary means by which startups and growth companies raise equity capital, according to the SEC. Still, raising this capital is expensive. The strong bipartisan passage of the JOBS Act should have sent a very clear message to the SEC. That is, outdated and excessive regulatory impediments must be addressed to encourage capital formation for our most promising entrepreneurial firms. “the Securities and Exchange Commission (SEC) to revise the filing requirements of Regulation D (which provides exemptions from securities registration requirements) to require an issuer that offers or sells securities in reliance upon a certain exemption from registration (for limited offers and sales without regard to the dollar amount of the offering [Rule 506]) to file, no earlier than the date of first sale of such securities, a single notice of sales containing the information required by Form D (used to file a notice of an exempt offering of securities under Regulation D) for each new offering of securities. “The SEC shall not: (1) require the issuer to file any notice of sales containing the information required by Form D except for this single notice; (2) condition the availability of the Rule 506 exemption upon the filing of a Form D or similar report; or (3) require issuers to submit written general solicitation materials in connection with a limited offering subject to Rule 506, except when it requests such materials pursuant to specified authority. This legislation is consistent with the goals of Title II of the JOBS Act by ensuring that small businesses do not face complicated and unnecessary regulatory burdens when attempting to raise capital through private securities offerings under Rule 506, while at the same time preserving important investor protections. If the SEC followed the clear intent of Congress, H.R. 4852 would not be necessary. But unfortunately, the proposed rules make Regulation D more expensive, complex and burdensome for small businesses, which was not the purpose of the JOBS Act. While the SEC adopted a rule lifting the ban on general solicitation and advertising for certain private securities offerings under Rule 506 of Regulation D, as mandated under Title II of the JOBS Act, the separate rule proposal would impose a number of new regulatory requirements on small companies seeking to utilize amended Rule 506, including proposals to submit additional Form D filings to the SEC in advance and at the conclusion of an offering, and to file written general solicitation materials with the SEC. In essence, one regulatory filing would be replaced with three, plus any written general solicitation materials. This means higher costs for small businesses. “The primary concern arising from the Proposed Rules results from an apparent error that the Commission made when drafting this proposal. Proposed Rule 503 requires a fifteen day waiting period, after filing Form D, before allowing advertisements- this restriction appears to violate the law by imposing a fifteen day ban on general solicitation. Title II of the JOBS Act lifted the ban on general solicitation for Regulation D 506 offerings to accredited investors. As a result, the Form D pre-filing requirement effectively violates Title II of the JOBS Act. “This ban on solicitation imposed via a pre-filing requirement would extend substantially longer than fifteen days, particularly for smaller businesses that have reduced access or experience with complex legal matters. If a business decides to proceed with advertising a 506 offering, it must first file an expanded Form D, which will require hiring qualified counsel and require considerable time to complete. Upon submission of a completed Form D, the issuer must then wait fifteen days prior to posting an advertisement. From our perspective, the statute clearly states that any marketing an issuer does must point prospective investors to the funding portal or broker’s site where the listing is posted. The point of this is to make sure that issuers limit the information about their offering to only the objective criteria laid out in the statute. Having issuers file general solicitation materials only adds unnecessary red tape, time and cost to the process. An issuer who is already limited in what they can “say” would need to incur the extra legal expense of a counsel review prior to sending it to the SEC, then wait for any feedback from either counsel or the SEC. This extra step does not provide any extra investor protection but unnecessarily increases costs for capital-strapped entrepreneurs. H.R. 4852 is a common-sense measure that would align the rules governing Title II of the JOBS Act with the clear intention of Congress, and would reduce costs and enhance the abilities of entrepreneurs to raise capital. small offering – the total amount of securities sold by the issuer during the 12-month period does not exceed $500,000. SBE Council believes this legislation would appropriately scale federal rules and regulatory compliance for small businesses, thus providing another practical option for entrepreneurs to raise the capital they need to startup or grow their firms. Small private companies would not have to incur formidable legal costs and uncertainties, and the SEC would not have to take any action. With fraud protection still in place, this legislation stands out as a sound, much-needed legislative step that reduces regulatory costs and legal risks. While SBE Council remains enthusiastic about the future of equity crowdfunding and the upcoming date of May 16 when Title III officially goes live, we support fixes that will lower the cost of raising capital, and allow for the growth of a dynamic and diverse funding portal marketplace. H.R. 4855 provides key fixes that are needed. Expanding investment levels for Title III crowdfunding and limiting the potential liability risks to funding portals again mean reduced costs, expanded opportunities for both entrepreneurs and investors, more innovation in the marketplace, and greater choice for small businesses. Finally, by way of suggestion, SBE Council is concerned with the application of anti-money laundering (AML) requirements to funding portals. AML compliance is quite costly, and since portals are prohibited from holding customer funds, imposing such mandates on funding portals would be duplicative and unnecessary. FINRA dropped this requirement in its final funding portal rules. However, it is our understanding that now Treasury wants to pursue it. “Proposed rule 300(b) would require funding portals to comply with Anti-Money Laundering (AML) and the associated ‘Know Your Customer’ requirements, to file suspicious activity reports (SARs) and comply with other aspects of the Bank Secrecy Act. This is a mistake of the first order. These rules are so complex and expensive to comply with that many European banks are now unwilling to accept U.S. customers and are terminating their relationship with existing U.S. customers. The Fix Crowdfunding Act could be amended to make it clear that funding portals are not subject to the AML rules given that they are prohibited from holding customer funds. To the extent that this legislation would reduce the costs, it would be another positive step for further enhancing the incentives and resources for investing in entrepreneurial ventures. “On Tuesday at an investor conference, the Goldman Sachs CEO explained how higher regulatory costs are crushing the competition. The JOBS Act amounted to a clear push in the opposite direction, that is, in the direction of reduced regulation and lower costs expanding opportunity for entrepreneurs to raise much-needed financial capital, and to expand opportunities for investors, lenders and crowdfunding facilitators. The idea is to expand entrepreneurial opportunities in the financial arena, and in the broader economy. These four legislative measures – H.R. 4850, H.R. 4852, H.R. 4854, and H.R. 4855 – would make further headway in a positive, pro-entrepreneur direction. Thank you for your time and attention. I look forward to your questions and further discussion.